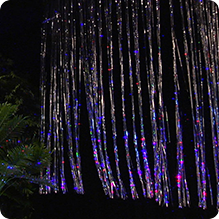 Silver metallic foil curtain, hundreds of hanging strips reflect the Laser's light for a mesmerizing visual spectacle. Twinkling effect increases with slight breeze. 5mm width hanging strips, 3' wide x 8' drop, double side adhesive tape on top.